ALPHA HI-TECH FUEL LIMITED is into the business of converting agriculture waste into Briquetted fuel. Briquettes being environment friendly replaces fast depleting conventional Fuel like Wood, Coal, Lignite, etc. 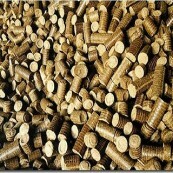 Use of Briquettes as fuel in Boilers, Kilns is economical and environment friendly. It is new and renewable source of energy. It supports farmers and strengthens rural economy. 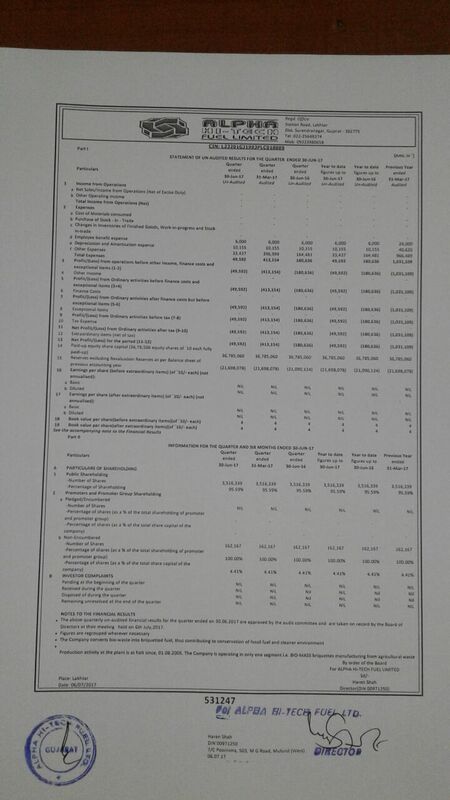 Industry is encouraged by various fiscal incentives. Binderless indigenous technology of Briquettes manufacturing is used for producing Bio-mass Briquettes which is also known as White Coal. The unit is located in the area of ample availability of raw material and is in the vicinity of consumers like chemical, pharmaceutical and textile industries. Recycle of resources supports cleaner and green environment initiative. Subject:-Updating the necessary KYC details of registered and/or joint holders holding shares in physical form. We refer to the SEBI Circular No SEBI/HO/MIRSD/DOP1/CIR/P/2018/73 dated 20th April 2018 & BSE Circular No LIST/COMP/15/2018-19 dated 5thJuly 2018 by which they have directed all the listed companies to record the PAN , Bank account details of all their shareholders and advise them to dematerialise their physical securities. Accordingly your Company has initiated steps for registering the PAN details (including joint holders if any) and the BANK ACCOUNT details of all the registered shareholders. We would also like to register other KYC details such as email id, mobile number, specimen signature and nomination. Your present status of each of these requirements is provided in the KYC form. We request you to kindly fill in the details in the KYC form and forward the same along with all the supporting documents based on requirements considering the below mentioned points. Single copy of supporting document is sufficient for updating multiple subjects. Original cancelled cheque leaf containing the details, Bank A/c No., Bank Name, type of account, IFSC Code, MICR Code. Legible copy of the bank passbook / bank statement specifying the KYC details of the registered shareholder such as the name, address, bank account number etc. duly attested by the officer of the same bank with his signature, name, employee code, designation, bank seal & address stamp, phone no. and date of attestation. For updating the Specimen signatures of the registered and/or joint shareholders: Affidavit duly notarised on non-judicial stamp paper of Rs. 100/-(format available on www.linkintime.co.in under Resources Download-General-Change of Signature- Affidavit for change of signature). Banker’s verification (format available on www.linkintime.co.in under Resources-Download-General-Change of Signature format for signature verification) Original cancelled cheque containing the details, Bank A/c No., Bank Name, type of account, IFSC Code, MICR Code and the name of the shareholder printed on the cheque leaf. If the cancelled cheque leaf does not contain shareholder’s name – legible copy of the bank passbook / bank statement specifying the KYC details of the registered shareholder such as the name, address, bank account number etc. duly attested by the officer of the same Bank with his signature, name, employee code, designation, bank seal & address stamp, phone no. and date of attestation. For registering Email id of registered shareholder: Email-id of the registered shareholder to be mentioned in the KYC form attached for all future communication in electronic mode (Go Green Initiative). For registering Mobile No. of registered shareholder: Mobile no. of registered shareholder for future direct communication F. For registering Nominee by the registered shareholder (if any): Nomination (Form SH-13) available on our website at www.linkintime.co.in under Resources-Downloads-General- Nomination. We request you to kindly forward KYC form duly filled in, along with copies of supporting documents for all the “Required” remarks IMMEDIATELY. As per SEBI directive, enhanced due diligence procedure will be applicable if KYC requirements mentioned above are not fulfilled. 7/C, POORNIMA, 503, M. G. Road, Mulund(w), Mumbai 400 080.